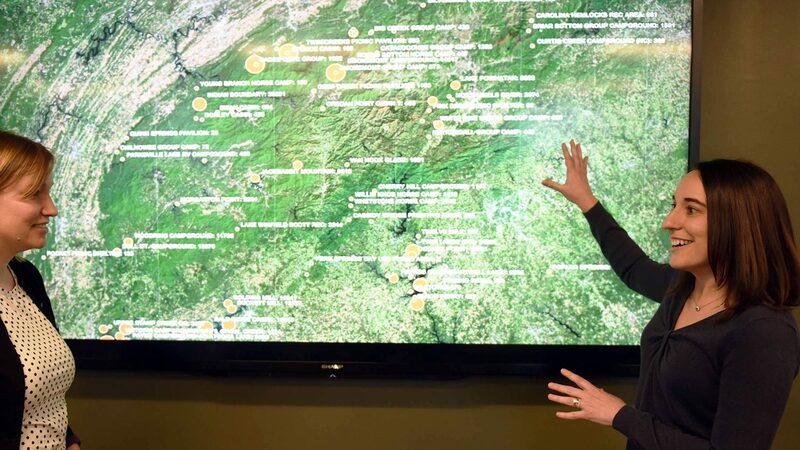 At the Center for Geospatial Analytics, teaching assistant professor Stacy Supak is a resident expert in teaching online courses. The three online GIS classes she offers each semester regularly total over 250 students, representing half of all the credit hours taken at the center. Over the past five years, she has instructed more than 1,800 students, the vast majority of them exclusively online. Now, with a Faculty Fellowship from NC State University’s DELTA, Supak is working not only to create top-notch learning experiences for her online students but also to discover which aspects of these experiences influence student success. Support from the fellowship will enable her to conduct a “teaching-related experiment,” she says, that will help faculty at NC State and beyond better understand what aspects of course design and student-content interaction influence online students’ performance. “For in-person classes, we know that attendance is correlated with student success,” Supak explains. “I teach exclusively asynchronous distance classes; delivery is all internet-based.” What factors, then, can explain student success in those courses? The question has long been on the minds of distance educators like Supak, and as a DELTA Faculty Fellow, she is working to answer it. Using data collected through the learning management software Moodle and the video hosting platform My Mediasite, she will begin by examining how students interact with course content as they prepare for assignments and exams. For example, Moodle records how long students spend on quizzes and how early they start them relative to the deadline; My Mediasite records for each student how much of each instructional video they watch. Examining these metrics could help instructors both understand student habits and identify which habits contribute to student success, Supak says. Data available from Moodle Analytics are likely quite important, she explains, but probably not the only indicators of student success. So Supak is also developing a survey to better understand how individual factors––such as reliability of internet access or self-reported tech literacy––also impact student outcomes. The data Supak collects from Moodle Analytics and the survey will inform the next phase of her research: an experiment to investigate the importance of interactivity in the online classroom to student learning. In on-campus classes, students are often called upon to answer questions during a lecture, but adding interactivity to online courses can be a challenge. Leveraging a new Moodle tool called H5P, Supak will test whether adding videos with interactive content to her courses improves students’ comprehension of key ideas. Supak teaches both an undergraduate course targeted towards NC State sophomores, GIS 280 (Introduction to Geographic Information Systems), and two graduate courses that are part of the center’s professional master’s program in Geospatial Information Science and Technology (MGIST)––GIS 510 (Fundamentals of Geospatial Information Science and Technology) and GIS 530 (Spatial Data Foundations). 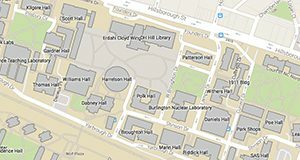 But, she says, “I get students from all across campus in both GIS 280 and GIS 510,” including students from the College of Sciences, College of Design, College of Humanities and Social Sciences and College of Engineering. GIS 280, GIS 510 and GIS 530 each require students to watch about 40 instructional videos over the course of the semester. These videos take the place of in-person lectures or provide step-by-step instructions for accomplishing a specific task with GIS software. In the near future, Supak will replace some of these videos with interactive ones that, for example, feature embedded quizzes or other activities to periodically check students’ comprehension and send results to the course gradebook. To accomplish these research goals during her fellowship, Supak will work with two teams at DELTA interested in learning management system analytics and in the assessment of student success in the distance education environment. With a passion for solving puzzles, Supak says that the fellowship work builds on her interests in experimental design as well as pedagogy. And the payoff will be getting to help NC State faculty better understand how their online students learn and improve student outcomes.